Barry Croft has lost his gold! Help him to jump and run through the beautiful worlds of the Temple of Yolo to find his gold. Be careful! There are many angry cats and birds. They want to stop Barry in each world. 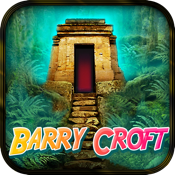 Help Barry Croft to run, jump and hide in this beautiful console-quality pixel puzzle platform game. An easy and smooth control makes it very funny and to jump or run. Download now, and get ready to harness the power of pure Yolo! check moerabbitgames.com for more games and info.